I love a good salad. This time of year, I’d rather have salad with a refreshing glass of iced tea than spend hours in the kitchen. I love a good refreshing salad that tickles my taste buds, especially if I’m not the one doing the chopping of the veggies! Wednesday, I was invited for a taste of the Boudin SF spring salad collection with a few local San Diego bloggers, at the Balboa Mesa location in San Diego. There are three new spring salads being offered by Boudin SF and they are sure to satisfy! The best part? Each of these generous portions of salad heaven come in under $10.00. My favorite salad was, without a doubt, the Lemony Couscous ($9.59). It had so many delicious textures and tastes that were perfect combinations. It is a vegetarian option, which is great! At the same time, you can add some of their tasty grilled chicken to it as well. It has: Israeli Couscous, garbanzo beans, diced cucumbers, grape tomatoes, Kalamata olives, roasted red bell pepper, feta cheese, drizzled with creamy lemon dressing. (435 cal, excludes dressing). Oh, Lemony Couscous! You could really split this salad with someone and be satisfied. All of the salads come with Boudin’s famous bread. You had me at lemon dressing! My second favorite was the Chicken Banh Mi (9.59 ). If you’ve never tried all the amazing things that Banh Mi has to offer, it is time to give this salad a try! The first time I tried Banh Mi, was a sandwich from a food truck in Downtown San Diego and it was love, for sure! This salad made me fall in love all over again! The Boudin SF Banh Mi salad contains sesame oil Mixed greens, Soba noodles, all natural diced chicken, fresh cilantro, cucumber, red bell pepper, pickled carrots, red onion, and jalapeño peppers tossed in sesame ginger vinaigrette. (463 cal, excludes dressing). Soba noodles with jalapeño? Yes, please! I really like the Chicken Kale Salad ($8.59)! While it didn’t top my list, it still is quite a contender! Kale is all the rage right now with foodies everywhere. There are those that love it and those that don’t think they do, will be completely won over with this salad! It has amazing flavor! The flavors balance each other very well. The kale has an almost sweet flavor and has just the right pizzazz! The salad contains: Chiffonade Tuscan kale and romaine lettuce, all natural diced chicken, grated Parmesan cheese, creamy Caesar dressing, topped with sourdough garlic crisps. (309 cal, excludes sourdough crisps and dressing). I love what the good folks at Boudin SF do. They have been a favorite of mine since I worked at a major department store at the Fashion Valley Mall in San Diego, when I was a graduate student. I loved to have lunch at Boudin on my lunch break. I love that they source local and organic ingredients at all their locations, whenever possible. They like to reward their guests’ loyalty and offer a loyalty program that offers perks and rewards. The three fantastic salads are available in stores throughout California, from March 25th through June 2015. For a Boudin SF location nearest you, consult their website. You can also contact the good people at Boudin SF on Twitter @boudinbakery or on Facebook. My brand new nephew at Halloween this year. He is just perfect! When Verizon Wireless offered to let me and my family try out the Withings Smart Baby Monitor, I couldn’t resist! My brother is in the military and is often out to sea. With this new, beautiful baby, it makes it tough. We all want to see him grow and watch his milestones. He changes each time I see him. The technology of the baby monitor has changed significantly since Allie Kat was a baby. We couldn’t share our monitor with friends and family the way it can be done today! When Allie Kat was a baby, we hadn’t considered the possibility of needing a baby monitor. Fortunately, my mom’s amazing best friend had considered this possibility and gave us one when Allie was born. It was before the days of video monitor popularity because video monitors were not yet affordable. We used the monitor all the time and we were so thankful to have it! It was nice to work out in the yard while Allie was napping and still be able to monitor her. The monitor allows you to log in to the Withings application on your Droid or Apple product and monitor your child remotely. What an ingenious idea! The monitor can be viewed from either a cell phone or tablet/Ipad, which is great! This is fabulous for anyone that has to be far away from their children. This little jewel box is the monitor! The monitor plays lullabies, has a night light, detects a change in room temperature, lets you speak to your baby and is perfect for a nightstand. All of the features can be controlled right on the monitor or remotely, using your desired Android/Apple device. You can designate more than one user, so Daddy who is out of town and Grandma who is out of town can both see what is going on with Junior. How cool is that? All the times that Mr. Bear had to be out of town, he could have logged on and seen our little princess fast asleep. I wish this was available when we were brand new parents! The Withings nightlight. Various colors available. It has been so much fun to have a new baby in the family and I just love to snuggle this little guy! I had an opportunity to babysit for a couple of hours. He is such an easy, content little guy and I am so happy for my brother and his family! I am hoping to babysit again soon. Disclaimer: I was given the Withings Smart Baby Monitor on loan by Verizon Wireless for my honest review. All opinions expressed are mine. I was not compensated for this review. I read a lot of non-fiction books. I prefer them mostly, as I am always looking for ways to improve myself and find myself perusing the self-help, nutrition, health and fitness sections. Occasionally, I will choose a fiction book that friends recommend, however, for the most part, I read non-fiction. I like to push myself out of my comfort zone sometimes and when I had the opportunity to read Touch and Go, New York Times best selling author of suspense, Lisa Gardner, I was excited to see what she had in store for me. I had not read any of Lisa Gardner’s previous books and was not familiar with her writing style. I wasn’t disappointed. The story opens with details about the Denbe family—a beautiful, picture perfect family that, by all appearances had it all. Within the first few pages, nevertheless, Libby Denbe narrates the story and I quickly learned that nothing is what it seems. Libby and Justin Denbe arrive home after a date night to be surprised in the foyer by kidnappers and nothing would be the same again. I enjoyed reading the book. I love Lisa Gardner’s writing style, her plot and character development and her surprise ending. I have to admit, I began having my suspicions of the “surprise ending” chapters before the story wrapped, although Gardner did have some other surprises in store for me. Gardner has an ability to paint vivid pictures and I found myself having a lot of difficulty putting the book down. There were a few nights when I could not sleep because I wanted to find out what would happen next. Before I knew it, I would get out of bed and come down stairs for a cup of hot tea and to take a massage on my chair with my book. If you are interested in massage chairs then go to https://reviewsfield.com/best-massage-chairs. I have already been browsing Amazon books for Lisa Gardner’s previous novels. I have to admit that I think I might be hooked. There is good reason for Gardner’s frequent appearances on New York Times Best Seller List. Disclaimer: This is a paid review for BlogHer Book Club but the opinions expressed are my own. I was compensated for my review, and received a copy of Touch and Go HOWEVER, I only recommend products and/or services I personally believe in. Growing up, we drank so much milk, we really should have had our own milking cow. I remember as a kid, having an enormous glass of milk with dinner, milk with cereal and often, a glass of milk when I got home from school. By the time I reached college, however, I stopped drinking so much milk because it seemed like every single time I had a tall glass of milk, I would have horrendous repercussions (from stomach aches to a gassy gut—oh, the joy!) Even the occasional dairy creamer in my coffee has caused me some discomfort. Over the years, I have tried many dairy substitutes, including soy milk. After doing some research, I began to steer away from soy milk in favor of almond milk. 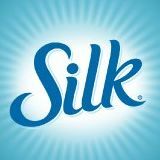 Recently, Silk Pure Almond Milk enlisted the help of 30 health and fitness bloggers to share their favorite Silk recipes on Facebook. The result is absolutely and deliciously wonderful! I love, love smoothies and am always looking for more recipes. There is a Chocolate Covered Cherry Smoothie, a Key Lime Pie Smoothie, or a Strawberry Rhubarb Pie Smoothie, a Long and Lean Smoothie to name a few. The Vegan Almondmilk Broccoli & Sage Risotto is on my list of things to try next. Deliciousness! Go ye to the Facebook page and see the yummy recipes for yourself! Silk Almond Milk is only 30 calories per serving. You can check out all the recipes on the Silk Facebook Page and find the recipes here https://www.facebook.com/SilkUS/app_574751085884802. Disclaimer: FitFluential LLC compensated me for this Campaign. All opinions are my own. Regardless, I only recommend products or services I use personally and believe will be good for my readers. I honestly love Silk Almond Milk and it can always be found in our fridge.